The primary purpose of the Center for Teaching Excellence is to build community among faculty members and to help instructors make student learning visible. 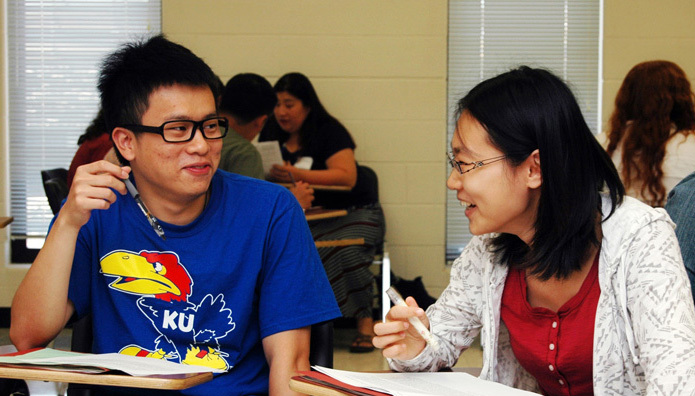 We facilitate meetings with small groups of faculty to find time-efficient and effective ways to improve student learning, assist faculty with representing the intellectual work they perform as teachers, and meet individually with faculty and instructional staff who want to discuss any facet of teaching and student learning. CTE also helps faculty develop teaching portfolios and course transformation posters, which are published on the CTE website. We also host workshops, conferences, and discussion forums on teaching and learning in higher education. In addition to portfolios and posters, we publish newsletters, research reports, and other works on the scholarship of teaching. Our organization was established at the University of Kansas in 1997 and currently comprises faculty members, graduate students, and post-doctoral educators who work in a variety of disciplines while maintaining an emphasis on teaching and student learning. CTE is advised by a board of faculty members (Teaching Excellence Advisory Members, or TEAM), a group of campus-wide department liaisons called Ambassadors, and several Faculty Fellows who assist with a variety of projects related to teaching. One of our main goals at CTE is to foster intellectual exchange about teaching in order to make good teaching visible across KU. Regardless of discipline, we want to help instructors find new ways to innovate and experiment. Some of these innovations can be found by browsing through our portfolio gallery, which contains examples and results of course transformations and other pedagogical strategies undertaken by professors here at KU. We are dedicated to building a community for teachers at KU where instructors can share their pedagogical concerns, successes, and research. CTE prides itself on being able to provide guidance and mentorship to teachers at all stages of their careers. We host numerous workshop and events, as well as a New GTA Conference before both the fall and spring semesters. If you are looking for assistance with matters related to teaching and student learning, CTE can finds ways to help. This website contains numerous resources for teachers. For example, we have several pages related to designing or redesigning a course, creating an inclusive climate, and teaching online. If you need ideas for developing a teaching statement, assessing student learning, or suggestions for the first day of class, we have resources to assist in those areas. We also have pages dedicated to using class time well, motivating students, and maximizing technology in the classroom. You can find support for helping students improve their writing and critical thinking skills, resources for GTAs, and a growing list of other teaching centers all across the globe. We cover a wide range of topics here at CTE, from grading strategies to representing your teaching. If you can’t find what you’re looking for on the website, feel free to contact us with questions or concerns.